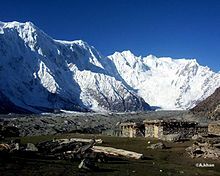 Muchu Chhish at far left is the tallest peak on earth that is not off limits to climbers that remains still unclimbed as of 2019. An unclimbed mountain is a mountain peak that has yet to be climbed to the top. Determining which unclimbed peak is highest is often a matter of controversy. In some parts of the world, surveying and mapping are still unreliable. There are no comprehensive records of the routes of explorers, mountaineers, and local inhabitants. In some cases, even modern ascents by larger parties have been poorly documented and, with no universally recognized listing, the best that can be achieved in determining the world's highest unclimbed peaks is somewhat speculative. Most sources indicate that Gangkhar Puensum (7,570 metres (24,840 ft)) in Bhutan or on the Bhutan-China border is the tallest mountain in the world that has yet to be fully summited. Gangkhar Puensum has been off limits to climbers since 1994 when Bhutan prohibited all mountaineering above 6,000 m (20,000 ft) due to spiritual/religious beliefs. Unclimbed mountains are sometimes referred to as "virgin peaks." Many virgin peaks exist because the mountain is unreachable, due to either geographic isolation or political instability. Some mountains remain off limits due to religious beliefs of a country or region that hold such mountains are sacred and should remain inviolate. Additionally, since the endeavor to scale taller mountains of the world is usually a major undertaking, lesser peaks, while still very formidable, simply get less attention than the taller ones, and instead these taller peaks are summited by parties following a new route or perhaps during the winter when conditions are generally more treacherous. Figure 1. Vertical arrows show the topographic prominence of three peaks on an island. The dashed horizontal lines show the lowest contours that do not encircle higher peaks. Curved arrows point from a peak to its parent. Many mountains, in addition to their highest point or peak, will also have subsidiary subpeaks. Generally, the topographic prominence of a peak or subpeak, as well as the general topography, all come into consideration when determining whether such apexes are considered to be independent peaks or subpeaks. Although objective criteria have been proposed for distinguishing peaks from subpeaks, there is no widely agreed standard. In 1994, the International Climbing and Mountaineering Federation (UIAA) classified 82 mountain peaks in the Alps whose summits were at least 4,000 m (13,000 ft) above sea level and with at least 30 m (98 ft) of topographic prominence over any adjacent mountain pass or col, as a distinct peak. It can be difficult sometimes to determine whether or not a mountain peak has been fully summited. Long before modern mountaineering commenced in the middle of the 19th century, evidence indicates that people did indeed travel up to the summits or near to the summits of major mountain peaks. Archaeological excavations in the Andes have shown that humans travelled up to 6,739 m (22,110 ft) in pre-historic times. Permanent settlements as high as 4,500 m (14,800 ft) were established as long as 12,000 years ago in the Andes as well. In the Greater Himalaya region, Lhasa, in Tibet, sitting at 3,650 m (11,980 ft) has been permanently occupied since the 7th century and many smaller settlements across the Greater Himalaya thrive at elevations exceeding 4,000 m (13,000 ft). With humans living at high elevations for many millennia, nearby peaks to such settlements may or may not have been summited at some point in the past. However, many regions away from settlements may have never before been explored, especially since some high peaks in the Greater Ranges are so remote that they were unknown to local inhabitants when first sighted by European explorers. The world's third tallest peak, Kangchenjunga, has been summited a number of times, but after the first climbers of the peak agreed to honor the wishes of locals and not set foot on the topmost part of the mountain, succeeding mountaineering parties may have followed this tradition. Similarly, Nanda Devi has also been climbed but the topmost summit was not ascended and the primary summit is now off limits to climbers. Machapuchare had only one summit attempt back in 1957 when climbers came within 150 m (490 ft) of the summit; Nepal then banned future attempts. The mountain most widely claimed to be the highest unclimbed mountain in the world in terms of elevation is Gangkhar Puensum (7,570 m (24,840 ft)). It is in Bhutan, on or near the border with China. In Bhutan, the climbing of mountains higher than 6,000 m (20,000 ft) has been prohibited since 1994. The rationale for this prohibition is based on local customs that consider this and similar peaks to be the sacred homes of protective deities and spirits, and the lack of high-altitude rescue resources from any locale closer than India. The prohibition was further expanded in 2003 when mountaineering of any kind was disallowed entirely within Bhutan. Gangkhar Puensum will likely remain unclimbed so long as the government of Bhutan prohibits it. It is unclear which is the highest unclimbed non-prohibited mountain. While some recognize only peaks with 100 m (330 ft) of topographical prominence as individual summits, the International Climbing and Mountaineering Federation uses a 30 m (98 ft) as the cutoff for determining individual summits. Based on the International Climbing and Mountaineering Federation's criteria, Muchu Chhish (7,452 m (24,449 ft) with a prominence of 263 m (863 ft)) in Pakistan is currently the world's tallest that has not been climbed even though it is legal to do so. Other unclimbed summits include one on the massif known as Kabru (7,318 m (24,009 ft) prominence c. 100 m (330 ft)), Labuche Kang III/East (7,250 m (23,790 ft)) with prominence of 570 m (1,870 ft) and Karjiang (7,221 m (23,691 ft) with a prominence of 895 m (2,936 ft)). Unclimbed candidates with high topographic prominence are by definition independent mountains, but some have relatively modest elevations. With such peaks there is a greater possibility of undocumented ascents, perhaps occurring long ago. Sauyr Zhotasy (3,840 m (12,600 ft), prominence of 3,252 m (10,669 ft)), the highpoint in the Saur Range on the border between Kazakhstan and China, and Mount Siple (3,110 m (10,200 ft), prominence of 3,110 m (10,200 ft)) on Siple Island off the coast of Antarctica, have no record of successful ascents, but the unclimbed status of each of these peaks is difficult to confirm. The following peaks, with a minimum prominence of 150 m (490 ft), were thought to be unclimbed as of August 2018. ^ a b Nuwer, Rachel (4 July 2014). "The mountains we have never climbed". BBC. Retrieved 14 February 2018. ^ "Mountain Classification". UIAA-International Climbing and Mountaineering Federation. Retrieved 14 February 2018. ^ Reinhard, Johan; Ceruti, Constanza (2010). Inca Rituals and Sacred Mountains: A Study of the World's Highest Archaeological Sites. Institute of Archaeology Press. ISBN 9781931745765. ^ Ghose, Tia (23 October 2014). "Oldest High-Altitude Human Settlement Discovered in Andes". Live Science. Retrieved 14 March 2018. ^ Gill, Nicholas (8 February 2016). "Where are the world's highest cities?". The Guardian. Retrieved 14 March 2018. ^ "The Four Forbidden Mountains in the Himalayas". Climb Report. 6 March 2016. Retrieved 16 March 2018. ^ Tsuguyasu Itami (October 2001). "Gankarpunzum & First Ascent Of Liankang Kangri" (PDF). Japanese Alpine News. 1. Retrieved 14 March 2018. ^ Jennings, Ken (14 December 2015). "What's The World's Highest Mountain That's Never Been Climbed". Conde Nast. Retrieved 14 March 2018. ^ a b Newcomb, Tim (19 January 2018). "7 of the Tallest Unclimbed Mountains in the World". Popular Mechanics. Retrieved 14 March 2018. ^ Jurgalski considers the unclimbed peak known as "Apsarasis III" just higher than "Apsarasis I" (7241 m), which was climbed in 1976. This page was last edited on 1 February 2019, at 01:41 (UTC).